Lean how to add files to your projects and tasks from your computer or Google Drive account. 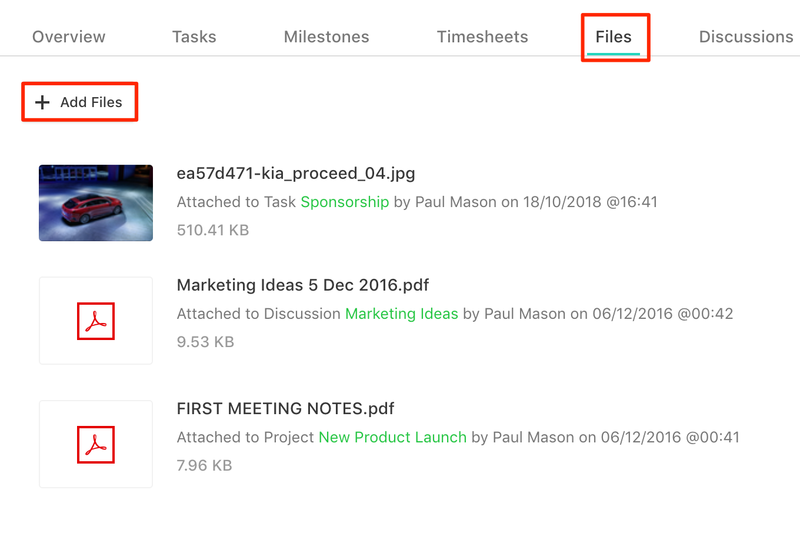 You can attach files either from your computer or Google Drive directly to a task or project. To do this at a task level, open the Full Task Details view of a task → click on Upload files (the pin icon) from the top right corner. All files will appear under the task's Files section. You can also organize files within a central file storage location for each project, so all the assigned users for that project have access to them. For this, go to the Files Tab of a project → click on the "Add Files button" → upload files either from your computer or Google Drive. You can always use our native integration with Google Drive to save on storage and keep files organized. As for the allowed file formats, you can upload the following ones: .doc, PDF, .csv, .xml, .png, .jpg, .psd, .cad, .zip etc. The maximum file size is 2GB.